The editors have collected 9 of the best AR games from the AppStore. Almost all of them are free and you can download them now. Game in the style shooters of the nineties. Task is to shoot the ghosts and monsters that appear directly in the room or any other room where you will run the game. To begin, you need to enable in-app camera to scan the floor, choose a point where it will be convenient to stand and where it will be easier to shoot. It is advisable to stand in the corner. For automatic shooting, you need to pinch the screen and bring the device to the enemy, as soon as it appears. The advantage of this game is that you can use the whole perimeter of the room, turning the camera and making the walls and floor. Is an arcade game similar to Flappy Bird, only harder. The goal is to help the bird escape from the pyramid and to fly free, not giving to fall back on the floor and not die. You need to enable the camera app and point it on the floor, then will come the start of the game. Using the touch screen, the player will lift the bird up in the vortex of shrinking and expanding rings. Thus it is necessary to collect items for which points are added. 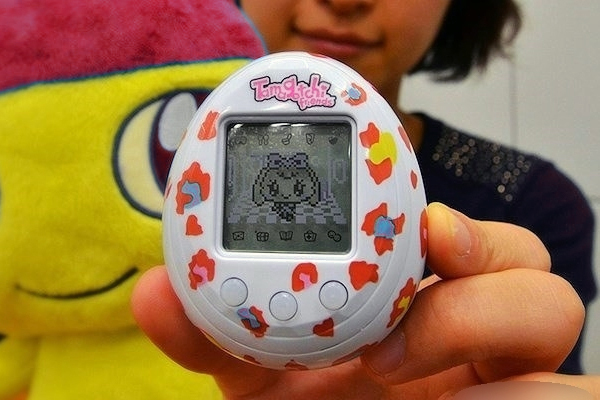 In the nineties on every corner you could buy a little Tamagotchi game. In this game the same principle. The smartphone lives the dragon that you want to remove, feed him, play with him and entertain. First you need to turn on the camera in the app and find the dragon in the room. Depending on the mood of the animal and the time of day he could be hiding in the kitchen, in the bedroom or in the bathroom. If the right to care and not to throw another, he will grow and become a big dragon. The game may appeal to children and those who are nostalgic for pocket monster from the nineties. Task — using facial expressions to control your character and collect points. The rules are simple — if surprised to raise eyebrows, the hero is the smiley jumping up, as if to frown, then it falls. If there is no possibility to leave the ball live, then come to the aid of this game. Through the in-app camera to scan the floor, then find room in the basket and touch the screen to try to throw the ball. Depending on the space changing the size of the basket. In a small room to throw the ball a lot harder. On the street or open space to play is interesting, as a basketball basket on the smartphone screen is displayed in full size, you can move on the real throw distance and throw the ball like in real basketball. Price — 75 rubles in the AppStore. The game is well known and has already managed to please many (more than 30 million downloads), because the developer decided in the latest version to add support for AR. 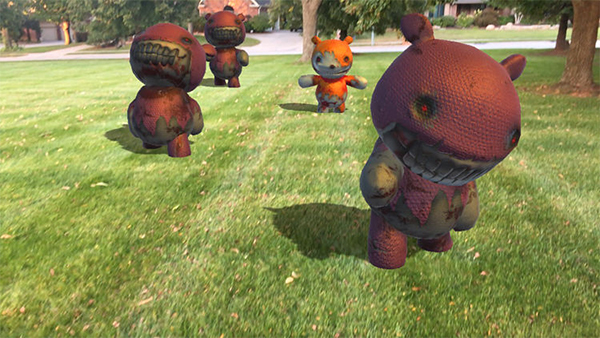 Task — using the camera in the app to find zombie bears in my room and mercilessly shoot them. There is a large selection of weapons, and the bears opponents on the screen can be strongly approximated, in the decorations of his apartment looks impressive. You can choose from different Lego sets (city, ships, dragons, cars, police, etc.) and play through the smartphone camera at home, not afraid to step on the parts. The app will definitely appeal to children, fans of the designers or those who do not want to throw Lego all over the apartment. The game-killer that is quickly gaining popularity. Task — to throw paper in the trash. But first you need to install a virtual bucket at any place indoors or outdoors. Rules resemble AR Sports Basketball. The most popular series of games drag racing got AR update. To travel in the style of AR apps will not work, but to look at the car from the game in a real environment — please.